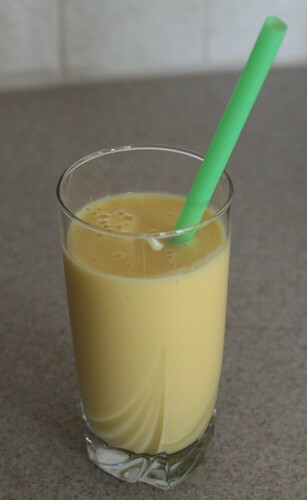 *CLOSED* Triple Mango Smoothie + Stonyfield Farms Blends Yogurt and Blendtec Blender Giveaway! How are everyone’s New Year’s resolutions coming along? Still following through or have you fallen off the wagon? I won’t judge, I promise. I’m plodding along — definitely more active, and trying to eat healthier, but I still like to eat too damn much! One thing I’ve started incorporating more into my routine is fruit and vegetable smoothies — it’s an easy way to get them in for the day and if I have one when I get home from work, then it usually holds me over until we figure out what we’re going to eat/reheat. For the past couple years, I’ve been using a personal blender to make my smoothies — it’s easy to use and clean up, plus I can drink right out of it, which appeals to the lazy slug in me. But it lacks oomph. I know I’m pushing the limits when I put a bunch of frozen fruit or ice in there, and it doesn’t do such a good job of blending up those baby spinach leaves. I’m kinda over it. 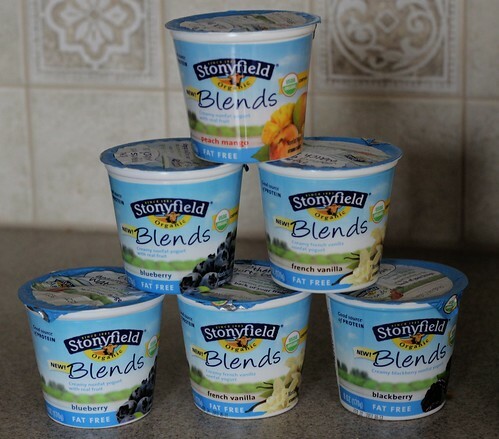 So when Stonyfield Farms contacted members of the Clean Plate Club a few weeks ago about sampling and reviewing their new Blends line of yogurt AND reviewing the Blendtec Total Blender Classic, it was the perfect opportunity and timing. Of course I said yes! My case of Stonyfield Farms Blends yogurts arrived first and I wanted to try them right away. Yogurt has been part of my life for quite a few years now and I’ve tried various kinds. Now, I will be honest and admit to being a Greek yogurt gal — I love the thick, creamy texture and the high protein and calcium content. What I’m not a fan of is the tanginess and I’m always adding stuff to hide it. I was a little nervous when I saw that the calorie count and sugar content of the new Blends yogurts was higher than my plain nonfat Greek yogurt (150 calories and 28 grams sugar vs. 80 calories and 6 grams sugar), BUT when you consider what I usually add to my yogurt to sweeten it up (fruit, fat-free pudding powder, fruit jam,etc.) it’s really not that bad, especially since the sugar in the Blends yogurt is coming from organic fruit, organic sugar, and organic juice — no fake-sounding ingredients! Plus the protein and calcium content is not too shabby, so far so good. I have so many ideas for how to use these yogurts — on their own as a snack, in baked ingredients, in popsicles when it’s not so cold, and of course in smoothies. In fact, I think these are PERFECT for smoothies — they come in all kinds of blendable flavors like french vanilla, strawberry banana, blueberry, peach mango, blackberry, and lemon. Oh, the possibilities! When the Blendtec Total Blender Classic Wildside came, I was excited to break it out and see how it would transform my smoothies. I read the instruction booklet and accompanying recipe book like a good little nerd and finally felt confident enough to test it out. For my first attempt, I used mango nectar, Peach-Mango Blends yogurt, baby spinach, and frozen mango. 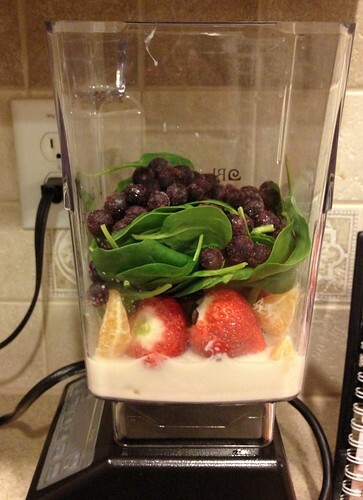 I put everything in that order into the Wildside jar, put the lid on and hit the “Smoothie” button. In less than a minute, I had a perfectly blended smoothie! I didn’t take pictures of that first one, but it was a beautiful lime green from the spinach, with nary a leaf in sight, and not a hint of its taste — just the mango. The Blendtec blender is LOUD, especially towards the end of its cycle, and poor Chloe ran away to hide, but this thing is a beast! You can tell how powerful it is. I heard of some people testing it out by tossing phones and other things in there, but I’m not crazy so I’ll pass on that! Cleaning up is easy though, the jar is dishwasher safe, but most of the time I just add a little dishwashing liquid and water and use the little nozzle thingamabob at the kitchen sink. So far, I’ve stuck to making smoothies in it, but plan to branch out into making frozen yogurt soon, maybe even sauces and soups. You can even make bread batter and ground meat in there! I think the personal blender may be getting retired soon. 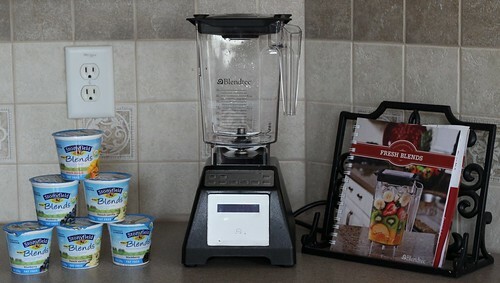 Enough yapping from me, but I wanted to give an honest review of the Blends yogurt and the Blendtec blender. Now we come to the part where I get to give away a case of Stonyfield Farms Blends yogurt and a Blendtec blender (value of $455) to one of you! 6. Tweet about the giveaway using the hashtag #StonyfieldBlends and mentioning @spicesbites, @stonyfield, and @Blendetc. **updated for clarification** You can tweet once per day and will receive an entry for each retweet. Got it? Good. The giveaway will run from Wednesday, January 30th through 9 PM Eastern time, Friday, February 8th, 2013. Once I’ve selected a winner, I will email you to get your contact info, so make sure you enter an email address when leaving a comment (it won’t show up in the comment). Giveaway is limited to U.S. residents age 18 and over. 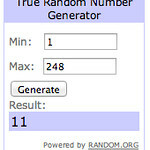 UPDATE: The giveaway is closed and a winner has been selected! *Disclosure: Stonyfield Farms Organic sent me samples of their new Blends yogurts to review and Blendtec sent me a Total Blender Classic Wildside (valued at $455) to review. I did not receive any compensation and am not obligated to post a positive review. Any opinions are my own. Stonyfield Farms Organic and Blendtec are providing the prize for the winner of the giveaway. Place items in blender jar in order listed. 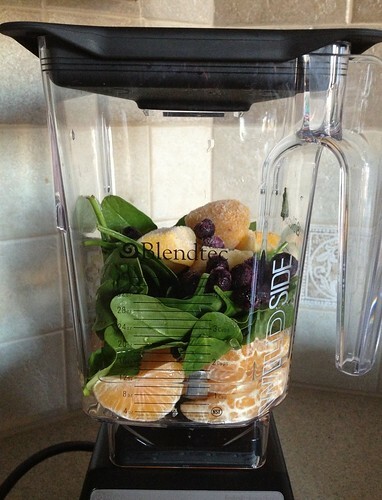 Make sure lid is in place, then hit “smoothie” button. I’d love to try Stonyfield Farms Blackberry! *swoon* YUM! organic fat free yogurt blends. I liked Stonyfield Farms on facebook. I’ve already liked Spice’s Bites on Facebook. I’ve signed up for the Blendtec Recipe of the Week. There are many things I would like to make using the Blendtec. I would start with a smoothie. Using kale seems to be the rage. I would also like to try to make my own nut butters. I’m excited about making some homemade jam/preserve. I think the new Stonyfield “Blends” are terrible. If I wanted pudding, I would buy pudding. What happened to my yogurt? Next post: Bruschetta Waffle Fries Are Here!